Birthday Present for my wife. Months ago she told me that if I ever needed an idea for a gift. To get her the new coloring books and pencils (can be found in Barnes & Noble). New thing I guess? I wasn’t thrill with just getting that for her. So our boys bought the pencils and books. I decided to make the box. Figured Walnut for sliding lid and bottom. 2 quarter inch rare earth magnents to keep it closed. Could there be more pleasure than make something for your partner. Nice box. Walnut top loks great. Machine the slot on the endpiece 1/32” narrower on the bottom than the side slide slots. Lightly bevel the underside of the end of the top. Tune by sanding the underside of the lid until it smoothly stops when dropped into place and that the bevel holds against gravity. Thanks Roger. Her Birthday is Thursday. Thanks Majuvla, I’m hoping she like it. Yes, the Walnut looks really nice, even better than more poor photography can share. I appreciate the tip. But I’m sligtly confuse by what you are saying. Could you explain a bit more? Normally the slot is 1/8” all round. I use a 3/32” thin kerf blade. I dado at 3/32” both sides and the end. I make a 2nd pass to bring the dado up to 1/8” except the end. When you try and put the tops 1/8” tongue into the 3/32” end slot it won’t fit until you bevel the bottom lip of the lid. Sand a bevel until the top goes in the slot and jams, holding the lid in place even when shaken. Press down & out at the end & it’ll pop free and fall out. Oh…. gotcha. This is my first pencil box (or slide top box) and felt rather rushed. I must give what you suggested a try next time. Normally the slot is 1/8” all round. I use a 3/32” thin kerf blade. I dado at 3/32” both sides and the end. I make a 2nd pass to bring the dado up to 1/8” except the end. When you try and put the tops 1/8” tongue into the 3/32” end slot it won t fit until you bevel the bottom lip of the lid. Sand a bevel until the top goes in the slot and jams, holding the lid in place even when shaken. Press down & out at the end & it ll pop free and fall out. Very nice gift. Really like the walnut. Thanks, BB1. Walnut is my favorite wood and I think maple is just the perfect contrast. I almost did it all in walnut, but felt the figured wood… would get lost. 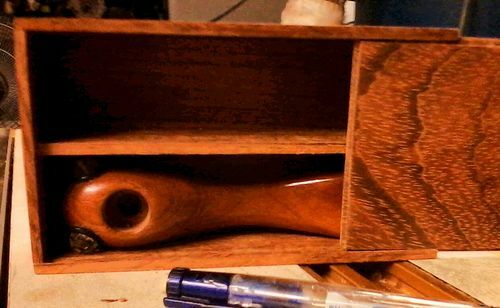 This box turned out nicely.